Former chief ministers- Digvijaya Singh from Bhopal, Ashok Chavan from Nanded and Harish Rawat from Nainital Udhamsingh Nagar have also been fielded. New Delhi: The Congress released its eighth list of candidates for the Lok Sabha elections 2019. 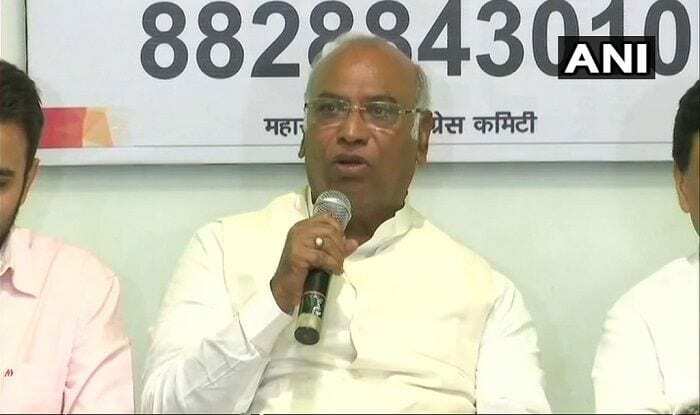 Veteran leader Mallikarjun Kharge has been fielded from Gulbarga while Manish Khanduri and Meenakshi Natrajan from Garhwal and Mandsaur respectively. Kharge is the Congress leader in the outgoing Lok Sabha while Khanduri is the son of Bharatiya Janata Party (BJP) leader and former Uttarakhand Chief Minister BC Khanduri. He had joined the Congress earlier this month. In Mathura, Congress has fielded Mahesh Pathak against actor-turned-politician Hema Malini of the BJP. Senior leader Digvijaya Singh from Bhopal, Ashok Chavan from Nanded and Harish Rawat from Nainital Udhamsingh Nagar have also been fielded. Former union minister M Veerapa Moily from Chikkballapur, Kanti Lal Bhuria from Ratlam and Rashid Alvi from Amroha are also contesting this upcoming polls. The list includes 18 candidates from Karnataka, nine from Madhya Pradesh, one from Maharashtra, two from Manipur, five from Uttarakhand and three from Uttar Pradesh. A total of 218 candidates have been announced by the Congress for the upcoming polls. Meanwhile, singer and dancer from Haryana Sapna Chaudhary joined the Congress on Saturday. Chaudhary joined the Congress at the home of party’s Uttar Pradesh unit chief Raj Babbar in New Delhi. The grand old party on Friday released the 7th list containing names of 35 candidates for the Lok Sabha polls. Uttar Pradesh Congress Committee (UPCC) chief Raj Babbar has been shifted to Fatehpur Sikri from Moradabad while Bahujan Samaj Party (BSP) chief Mayawati’s former aide Naseemuddin Siddiqui has been given a ticket from Bijnor. The Congress also released a list of 54 candidates for Odisha Assembly election yesterday.